Both of these teams have endured some coaching carousel drama over the last month. NC State’s Dave Doeren was an early target in Tennessee’s never-ending coach search but ultimately he spurned the Vols to stick with the Wolfpack. Doeren has NC State playing in their fourth straight bowl and should the team stay competitive next year he’ll probably be in the running for an even bigger job at the end of 2018. Arizona State made the odd, in my opinion, hire of Herm Edwards. Herm is a master motivator for sure but Herm has not been involved with the college game since 1989. Even more odd is that outgoing coach Todd Graham is sticking around to coach the bowl. 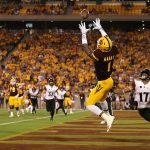 Arizona State’s offense is led by two NFL hopefuls in senior RB Kalen Ballage and sophomore WR N’Keal Harry. Ballage is a big back at 6’3″ and 230lbs. His size concerns me because few backs have been successful in the NFL at that height. Since 2010, only four backs have measured 6’2″ and 225lbs or bigger at the combine: Derrick Henry, Matt Jones, Dominique Brown and James Wilder. Henry has potential but he has not yet earned the starting role in Tennessee and teams may be hesitant to roll the dice on a big back like Ballage. Ballage has not handled a full load in any of his four seasons but he is a productive pass catcher (44 receptions in 2016, 19 this year). His high number of carries came this year with 153. He has under 2,000 yards in his career. I’m just not able to get that excited about him, honestly. I have read comparisons to David Johnson but I think that is crazy: Johnson was more than twice as productive in most stat categories in college. Ballage will get drafted in fantasy leagues but it won’t be by me. 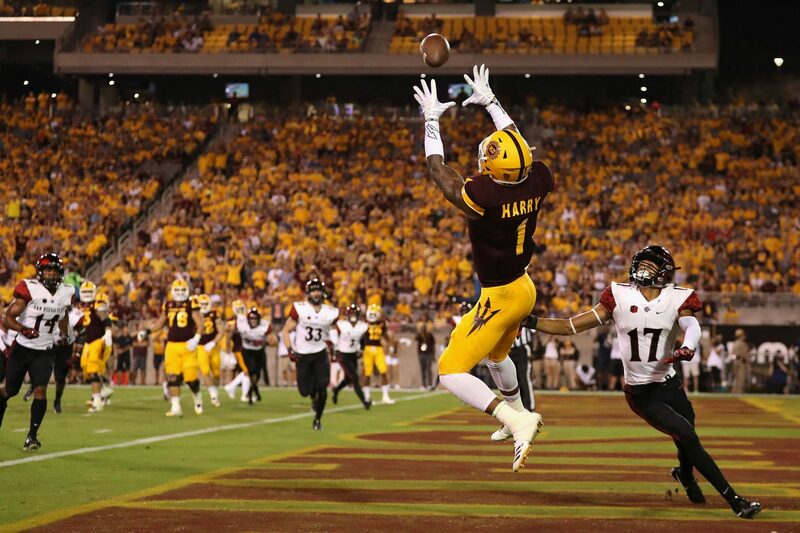 The other big name for the Sun Devils is WR N’Keal Harry. Harry is not draft eligible so it’s not worth a deep dive yet but you will hear his name constantly next season. 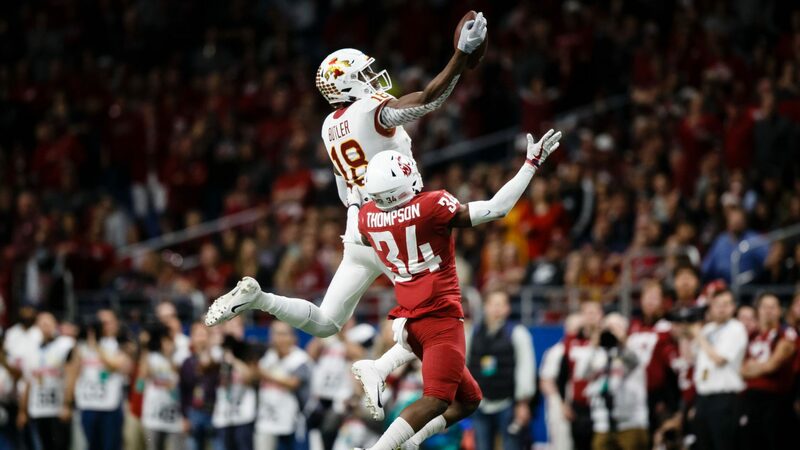 He has elite height (6’4″) and has been very productive as a young receiver on a mediocre team (career line of 131-1,659-12). Add Harry to your 2019 short list now! 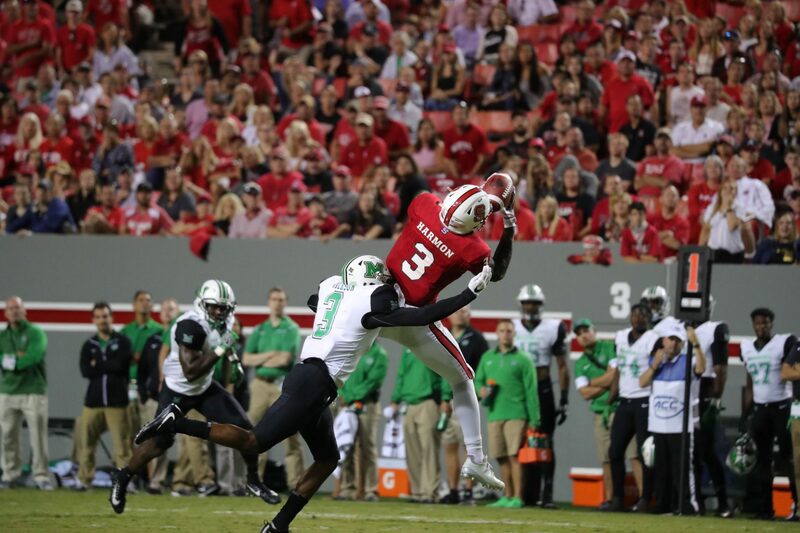 North Carolina State has three draft prospects that I will touch on. First and foremost is DE Bradley Chubb. I mentioned Chubb a few times in the middle of the season when NC State was looking like it could challenge Clemson for the conference title. He has 25 sacks and 54.5 tackles for loss in his career. Chubb is relentless and should be a Top 5 pick in the NFL Draft. Sadly, he’s banged up and may miss the bowl game. On offense, QB Ryan Finley and TE Jaylen Samuels are the two to watch. Samuels is one of my favorite players of the season because he transcends position. He is listed as a TE but he’s really too small to play the position in the NFL. Instead he’ll probably factor in as a hybrid RB, FB, TE who lines up all over the field. To give you an idea of Samuels’ versatility, look at his 2017 stats: 68 receptions, 547 receiving yards, 4 rushing TDs, 72 rushing attempts, 387 rushing yards and 11 rushing TDs. Samuels was the only player in the FBS with more than 65 receptions and rushing attempts. More so than any other prospect, Samuels’ 2018 fantasy value relies heavily on his landing spot. If he gets drafted by a team with a creative offense he could turn into the ultimate third down and short yardage weapon. Finley is a late round quarterback prospect that is hard for me to get excited about. He should add a few pounds to his 6’4″ frame because he’s listed at just 210lbs and may be lighter. He’s efficient and does not turn the ball over often. Finley does have another year of eligibility so we could see him come back for another season to improve his draft stock. WalterFootball.com has him as QB16 for 2018 while NFLDraftScout.com has him as QB14 in his 2019 class. If he can show a more prolific side to his game in 2018, he could become a mid-rounder next year. I don’t care what the name of this bowl is, it’s the Rose Bowl to me. I hate the fact that with the new CFP we lose the historical tradition of some of the biggest games. The folks running the Cotton Bowl got themselves a doozy of a matchup with two Power 5 conference champions and a slew of NFL prospects. Covering each and every one of the draft hopefuls in this game is impossible – I will touch on a few but by no means is this a comprehensive list. Let’s start with Ohio State. By now, we have all heard and participated in the debate about whether or not Ohio State should have been in the playoff. I fear that topic will be prominent during the telecast and will overshadow some of the great players on the field for the Buckeyes. QB JT Barrett improved on a number of stats this season but probably hurt his chances of playing quarterback in the NFL after poor performances in three big games (against Iowa, Michigan [before the injury], and Wisconsin). I don’t have an opinion yet on whether Barrett should enter the draft process as a QB but my gut says he will. The RB duo of freshman JK Dobbins and redshirt sophomore Mike Weber was very productive (nearly 2,000 combined rushing yards and 17 TDs). Dobbins took advantage of an early, and lingering, injury to Weber to steal the lead role. If Weber comes out for the 2018 draft, I think his stock is less now than it was four months ago. He could return but it’s clear he won’t be the first choice back. Maybe he transfers, sits out a year, and dominates at a lower level Power 5 school in 2019. I listed Weber as my RB13 in November so if he does come out he’s a mid-rounder at best. The strength of Ohio State’s team lies outside of the offensive skill positions. Drafttek.com has six Buckeyes ranked in their Top 10 NFL draft prospects from the Big Ten: three defensive linemen (Sam Hubbard, Tyquan Lewis, Dante Booker), one corner (Denzel Ward) and two offensive linemen (Jamarco Jones and Billy Price). I’ll venture a guess that four of the six go in the first round (Ward, Hubbard, Price, Jones) with the other two following on Day Two. The best prospect on the defense, sophomore DE Nick Bosa, is not yet draft eligible but he’d be a first rounder too if he were. The biggest name on USC’s team is QB Sam Darnold but he has really hurt his draft stock this season. Darnold was a walking turnover in 2017: 12 INTs and 10 fumbles (7 of which were lost). Elite quarterback prospects just can’t turn the ball over that often; for comparison, Rosen (13) and Mayfield (5) combine for fewer turnovers than Darnold. Darnold is only a redshirt sophomore so he is young and still has two more years of eligibility should he decide to return to college for further seasoning. Ultimately, I think Darnold comes out and is a Top 3 pick because of the potential the he has shown. Despite his turnovers, the yardage, scoring and efficiency are all above average. He’s also an above average runner with enough speed to earn first downs when flushed from the pocket. What Darnold has that doesn’t show up in the box score is his confidence and swagger. If I had to pick one college QB to lead my team in a comeback, I would take Darnold because he wouldn’t shrink from the challenge. One negative: Darnold’s throwing motion. I noticed this in the offseason and plan on watching more film before the draft to see if it’s improved. Darnold’s favorite receiver is WR Deontay Burnett. Burnett is undersized (6’0″ and 170lbs) so he likely won’t garner early round attention but I’ve raved about him numerous times this season. A close size comp for Burnett would be Travis Benjamin who was a 4th round pick back in 2012. Burnett was good, but not great, this season going for 74-975-9. I started the season low on RB Ronald Jones but I came around by mid-September. He is just so quick and agile that it’s almost not fair to defenders. I was previously concerned about his size but no longer. Even though he missed a game due to injury, Jones totaled 1,486 yards and 18 rushing TDs; he added 13 receptions for 165 yards and another score. After a down game against Notre Dame, Jones ended the season strong with over 800 yards and 10 TDs in the last five games. He’s fun to watch and I am so happy he won’t be skipping the Cotton Bowl. On defense, the Trojans have a number of prospects including Cameron Smith and Porter Gustin. 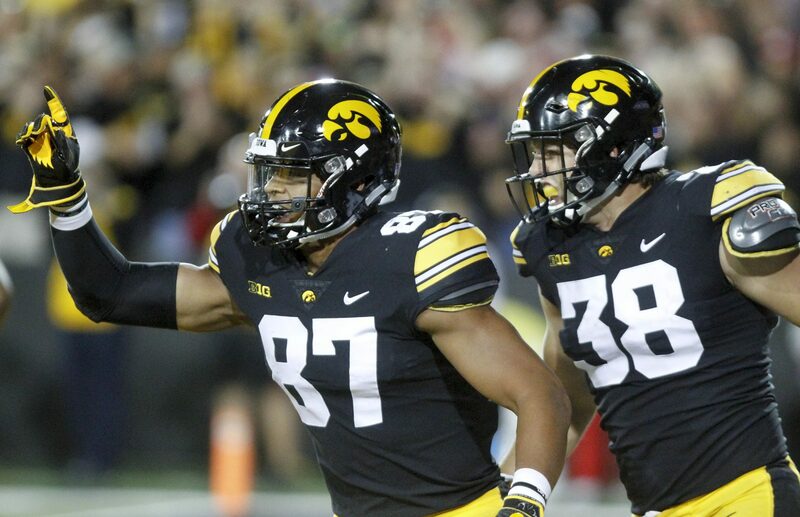 Gustin missed most of the season, and is doubtful for the bowl, but could get drafted based on a solid sophomore season if he comes out (68 tackles, 13 tackles for loss, 5.5 sacks). Smith is a prototypical MLB who has 263 career tackles and has been a big part of the USC defense for three years; according to WalterFootball.com he is looking at a mid-round grade. As far as the NFL Draft prospects go this matchup is all about Louisville, let’s touch on Mississippi State first though. QB Nick Fitzgerald could be an interesting study in 2019 but I don’t think he has enough of a resume to warrant coming out for 2018, especially after a season-ending ankle injury sustained on Thanksgiving. NFLDraftScout.com has him as the QB6 in his 2019 draft class. 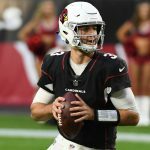 Fitzgerald will need to improve on his efficiency in 2018 because he doesn’t complete enough passes (55.6%) and throws too many INTs (15:11 ratio this season). He’s a tremendous rushing threat with 33 career rushing TDs and nearly 2,500 yards but that won’t matter to scouts if he’s missing throws. The backup QB is freshman Keytaon Thompson. I don’t think I have seen any of Thompson play this season but I am intrigued by the combination of his size (6’4″ 222lbs) and rushing ability (he played in nine games this season totaling 299 yards and 3 TDs rushing). Thompson played significant snaps in the Egg Bowl vs Ole Miss after Fitzgerald went down so at least he’s not coming in cold. He rushed for 121 yards and a score but only completed 13 of his 27 passes for 195 yards. I came across the name of DB JT Gray on NDT Scouting’s website while researching potential draft prospects from Mississippi State. He has played at both linebacker and safety and his listed measureables are similar to those of Jabril Peppers who was a first rounder last year; maybe he could be a poor man’s Pepper in the late rounds. Per Pro Football Focus, Gray did not allow a single TD in coverage this year and the passer rating against him was 70.4 which is above average. Louisville has their own DB, Jaire Alexander, who excels in those same metrics. Alexander has also shut out opposing receivers and, this is not a typo, has allowed a passer rating against of just 17.7. For comparison, a QB who had one completion for negative nine yards would have a rating of 16. Alexander allowed just five receptions on the season and ranks 5th in PFF’s “Cover Snaps per Reception” stat, meaning he is in coverage a lot and allows few receptions. Alexander declared for the 2018 draft already and is skipping the bowl so you won’t get to see him play against Mississippi State but you’ll see him playing on Sundays soon. You may be thinking to yourself, how has he not mentioned Lamar Jackson yet? You’re right I may be burying the lede but Jackson has been talked about ad nauseam on every platform this season. That includes me too: I tagged Jackson in eight of my weekly The Watch List pieces and focused on him in my preseason preview. Talk of Jackson changing position is useless, in my opinion, because Jackson will go into the NFL as a quarterback. If anything, the brief spark of Deshaun Watson this season shows NFL teams that a lightning quick deep-ball thrower with accuracy issues can still lead a team to victory. Some team will take Jackson in the first round but I don’t think I’ll be taking him in any of my fantasy drafts. Jackson’s top target is junior WR Jaylen Smith. Smith is 6’4″ and 219lbs which is great size for a receiver but it’s his speed and deep-ball ability that makes him a threat to the defense. To illustrate this, despite his size, only three of his 53 receptions came in the red zone; meanwhile he had seven receptions of 25+ yards. He totaled 873 yards and 6 TDs (he missed three games due to a wrist injury). I’m not as high on Smith as some, including our friends at Dynasty Command Center who have him as their WR5 for 2018 rookies. Jackson and Smith versus the stout Bulldog defense will be fun to watch, regardless of what you think of their NFL chances. Iowa State had a whirlwind of a season. Get it? The Cyclones had a whirlwind…. okay, okay I’ll stop. Seriously though, Iowa State was a surprisingly fun team to watch this season. 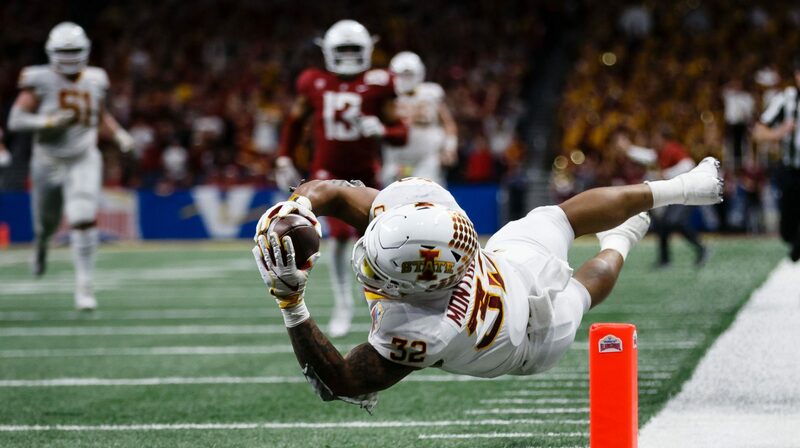 They had a number of interesting story lines throughout the season including 1) an up-and-coming head coach in Matt Campbell, 2) jack-of-all-trades Joel Lanning playing at both LB and QB in a number of games, 3) the continued emergence of RB David Montgomery, 4) the revolving door at quarterback including underclassmen, walk-ons and transfers and 5) the upset of #3 Oklahoma and #4 TCU. Montgomery is fantastic. He has good speed, is amazing at breaking tackles and gaining yards after contact and is a reliable receiver. He is just a sophomore so he’s not coming out in 2018 but there’s a chance he is my top RB next year. Leading receiver Allen Lazard is a 6’5″ red zone monster (15 of his 25 career touchdowns came inside the twenty). I think Lazard is underappreciated as far as draftniks go. I had him as WR13 a few weeks ago but will likely move him up into the WR10 range. The Iowa State defense has played well most of the season and is led by emotional leader Joel Lanning (the aforementioned former QB). As much as I enjoy rooting for Lanning, I don’t think he’ll be considered by NFL teams. Memphis has an incredibly efficient and high scoring offense that will be fun to watch against the solid Iowa State defense. QB Riley Ferguson is a former Tennessee transfer who has played exceptionally well in his two seasons at Memphis. Ferguson throws a lot of touchdowns, completes more than 63% of his passes, has never thrown more than 10 INTs in a season and has 10 career rushing touchdowns. He’s also 6’4″; like Ryan Finley at NC State he is just 210lbs so needs to add some weight for the NFL. I think Ferguson sneaks up NFL draft boards and gets taken on Day Two. Ferguson’s top target was undoubtedly WR Anthony Miller. I fell in love with Miller in the preseason when I jokingly compared him to Antonio Brown. In hindsight that comp may have been more accurate than I could have guessed. Miller caught 92 balls for 1,407 yards and 17 TDs. Miller has unreal hands, great body control and is tough. If you watched the AAC Championship game you might recall how exhausted and banged up he was yet he was on the field and still making plays when it mattered the most. I want him on my NFL team and my fantasy team and I don’t care what pick it takes. In September, I had him at 2.02 for 2018 rookie drafts but now I would even be willing to part with a late first for him. This PAC-12 vs Big Ten matchup definitely has less going for it than the Ohio State vs USC matchup but it’s still a game with some key NFL prospects to keep an eye on. Thankfully, Penn State RB Saquon Barkley confirmed back in November that he planned to play in the team’s bowl game. Penn State was looking like a favorite to make the playoff when they were ranked #2 in late October but back-to-back losses to Ohio State and Michigan State put an end to that. Even the most casual of fan knows about Barkley and I have covered him exhaustively for RSO. In fact, I tagged Barkley in thirteen different articles this season. My deepest dive on Barkley came in the preseason in my Big Ten conference preview. At some point you just run out of things to say but he was so dominant at points he just demanded to be discussed. Barkley ran the ball less this year but he increased his yards per attempt (5.5 to 5.7) and became more involved as a receiver (47 receptions, 594 yards and 3 TDs). He’ll likely be a Top 5 NFL Draft pick and will be the unanimous 1.01 pick in fantasy rookie drafts. QB Trace McSorley is also draft eligible but he will probably return for another season. He won’t be able to improve on his size (just 6’0″ and 202lbs) but he can continue to improve his efficiency and yards per attempt. The pass catcher with the highest draft grade in my opinion will be TE Mike Gesicki. Gesicki went for 51-501-9 this season and had one of my favorite highlights of the season when he hurdled McSorley after a touchdown. Penn State keeps track of some combine-like measureables and supposedly Gesicki ran a 4.54 40 yard dash – that is crazy good for somebody his size. I expect that number to increase at the combine, it must be the benefit of some “home cooking,” but still he’s looking at a favorable size/speed comp to the likes of Jimmy Graham and Travis Kelce. The first round may be too early for Gesicki realistically but he’s a Day Two guy at worst. The Nittany Lions’ top defensive prospect is senior safety Marcus Allen. I researched him in the preseason and was nonplussed. I felt he needed to show scouts that he was equally as good in coverage as he is in run support. He still succeeded in run support (just two missed tackles against the run per Pro Football Focus) but he only had one interception (the first of his career) and had just two pass break-ups (just ten in his career). He’ll probably start his career as a situational player and won’t be an IDP factor right away unless he can prove he should stay on the field for every snap. Washington QB Jake Browning finished 6th in Heisman voting in 2016 after a huge 43 TD season. Unfortunately for Huskies fans, that season was the outlier for Browning as he returned to his 2015 levels with just 18 TDs this year. His completion percentage did increase significantly this year (62.1% to 68.8%) but all of his other rate stats decreased. One of my favorite plays in football is the quick kick from a quarterback and Browning excels at that: he has 11 career punts, averaging about 35 yards per kick. The two offensive standouts are WR Dante Pettis and RB Myles Gaskin. I’ve never been a huge fan of either and I am willing to admit it is probably an east coast bias since I don’t see them play that often. I previewed Pettis in the preseason and expressed concerns that his size would limit him in the NFL. Pettis played in thirteen games each of his first three seasons so he’s avoid any long-term injuries but he is currently hurt (but probabl for the bowl game). He is a good receiver (averaging 40 receptions, 500 yards and 6 TDs per year over his four year career) but a better punt returner (9 career punt return TDs, including 4 in 2017). He’s currently my WR8 and should find himself drafted in the late second round. RB Myles Gaskin is ranked a little lower in my positional rankings (RB13) but he’s somebody that I definitely need to revisit. Gaskin’s numbers are great and if they were attached to a different name I would probably be higher on him. He rushed for 1,282 yards this season and rushed for 19 TDs. He also added 18 grabs for 228 yards and 3 receiving scores. He has been consistent, and healthy, throughout his three year career. He’s gone over 1,300 total yards each year and has 47 career TDs. He’s slightly undersized (think Theo Riddick) but not so small that he can’t play a heavy role in an NFL offense. On defense, LB Azeem Victor and DT Vita Vea are both likley Day Two prospects. Victor’s college career has been marred by injuries and off-field issues (he was suspended to start 2017 for a failed drug test and was suspended late in the season after a DUI arrest). In 2015, his only full season, Victor had 95 tackles, 9 tackles for loss, 1.5 sacks and an interception. Vea is an agile, space-eating DT who could end up going in the late first if he dominates the combine. Chris Trapasso of CBS Sports had Vea going 19th overall in his December 5th mock; Trapasso thinks that Vea may be the most physically strong prospect in the entire draft class. The Orange Bowl may feature two Top 10 teams but I’m just not finding the matchup all that intriguing. I was down on Miami for most of the season before the team imploded against an unranked Pitt team and laid an egg against Clemson in the ACC Championship game. At least Wisconsin was competitive in their conference championship and proved that they belonged in the playoff conversation despite a weak schedule. Hurricanes QB Malik Rosier was overrated, in my opinion, during Miami’s unbeaten run to start the season. He ranks 89th in adjusted completion percentage according to Pro Football Focus; that metric is meant to give a better picture of a quarterback’s accuracy by not counting spikes/throwaways against them and by giving them credit for drops. Per their stats, the Miami receivers dropped 22 passes, which is about average, but even after factoring those back in he is still at the bottom of the list (there are only twelve worse qualifying QBs). Rosier did rush for 427 yards and 5 TDs which helps make up for his negative plays but it’s not enough in big games. Case in point: Rosier was pulled late in the Pitt game to give redshirt sophomore backup Evan Shirreffs a shot. Shirreffs had five career passing attempts at that point so in that moment the coaches though he gave them a better shot than Rosier (predictably, Shirreffs did nothing and was replaced by Rosier). Miami lost RB Mark Walton early in the season but sophomore Travis Homer has emerged in his stead. Homer has over 1,100 total yards and scored 8 TDs. He had a big game against #3 Notre Dame (18 rushes for 146 yards) but had just 55 combined rushing and receiving yards in the late losses to Pitt and Clemson. If Miami is to stand a chance against Wisconsin’s great defense it will fall on Walton. 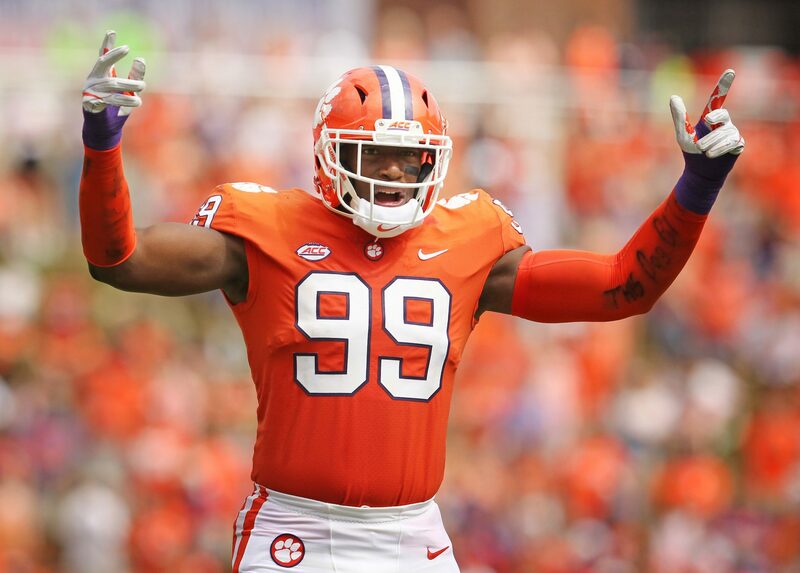 Senior DE Chad Thomas had 30 total pressures per PFF and finished the year with 3.5 sacks. Safety Jaquon Johnson improved his stats in 2017 to end with 85 tackles, 2 forced fumbles, 2 fumble recoveries and 4 INTs. Miami’s defense did get better in 2017 but gone are the days when the NFL Draft was littered with Hurricane defenders; Thomas and Johnson could be mid-round picks but I doubt anybody goes higher than that. Speaking of defense, Wisconsin’s is a juggernaut. They are 4th in scoring, 4th against the pass and 1st against the run. They don’t have a weakness and it’s unfortunate we did not get to see them play a stronger schedule. We may never know if this was a historic unit or just a product of a soft schedule. Their leader, LB TJ Edwards, is good in both run support (27th ranked in run stop percentage per PFF) and in coverage (4 INTs). 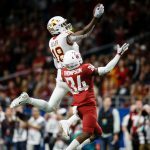 According to DraftTek.com, he’s the 11th ranked prospect in the conference and according to WalterFootball.com he’s looking at a 3rd-5th round grade. Edwards may not be a Watt brother but he’s keeping up the tradition of productive Wisconsin linebackers with initials instead of first names! The Badgers offense is all about freshman RB Jonathan Taylor. Taylor had 1,847 rushing yards and 13 TDs this season and he finished 6th in Heisman voting. Those rushing yards ranked him first in the conference and third in the FBS. Not bad for a three star recruit. Taylor still has two more seasons before he’s draft eligible so we have to wait and see what he develops into but he’ll probably be on my Heisman watch list for next season. Aside from offensive tackle Beau Benzschawel, the best offensive prospect is TE Troy Fumagalli. Fumagalli has a long injury history that I discussed in my Big Ten preview, but I still like his chances in the NFL. He’s more of a traditional TE than the “move TE” that is en vogue right now so that may lower how high he is drafted. Regardless of where he is drafted, he will be on the field from day one because of his above average blocking ability. Fumagalli led the team with 43 receptions, 516 yards and 4 TDs. He has already declared for the NFL Draft but Fumagalli has confirmed that he will play in the bowl. Fumagalli may not be a fantasy factor in his rookie season but he’ll still be worth a third round pick. Clemson – based on resume more so than the eye test. Clemson has beaten three top teams (#13 Auburn, #14 Louisville, #12 Virginia Tech) and up until this point has the harder schedule between them and Alabama. Alabama – the Tide may end up being a victim of a weaker SEC and their weak cross-division schedule this season. There’s no regular season matchup against Florida or Georgia this season and the jewel non-conference win against Florida State is looking less special as the weeks progress. Alabama will likely have two back-to-back Top 10 games to end the season against Auburn and in the SEC Championship game but by then I think Clemson will be well established as #1. Georgia – There’s no way the CFP committee would actually have Alabama and Georgia play in the semi-finals since it’s likely a SEC Championship repeat but it would still be awesome to see. Georgia is a lot of fun to watch and they will challenge Alabama if they both make it to the end undefeated. TCU – I struggled with putting TCU over Penn State for the last spot. Ultimately, I went with resume over the eye test again as I did above. TCU has two Top 25 wins (#6 Oklahoma and #12 West Virginia) while PSU has zero. Penn State – However, Penn State will have a chance to prove themselves over the next three game stretch. They are off this weekend but will then face #17 Michigan, #9 Ohio State and #21 Michigan State in successive weeks. Co-Backups in Clemson: File this under something I have never seen before, Clemson has named Zerrick Cooper and Hunter Johnson as “co-backups” on their updated depth chart. Hmm. The reason for the subterfuge is starting quarterback Kelly Bryant’s ankle injury. Some reports say that he’ll play while others say it is a game time decision. Who knows. My gut says that he will not play and Dabo is just playing with Syracuse’s ability to gameplan. Bryant is also the team’s leading rusher (97 carries, 401 yards, 7 TDs) so having to factor for him is a big deal if all that goes out the window when he is inactive. If Bryant can’t go, I expect Hunter Johnson to take the lead. He went 5-5 for 42 yards and a score against Wake Forest when he split relief duties with Cooper. Johnson is a former 4-star recruit who was #21 in the ESPN300 and was the top quarterback recruit of his class. The concern is less about Syracuse, I would expect Clemson to win either way, but more about the tougher games against North Carolina State and Florida State coming later in the month. Bryce Love, RB, Stanford: There’s a lot of talk about the East Coast Bias that is going against Love and that he’s being ignored. That’s certainly not the case here at Reality Sports. 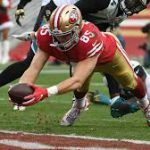 It’s unfortunate that there is not more tape of Love available – DraftBreakdown.com has just one game from 2017 and one from 2016. I decided to fire up that lone 2017 film and take a closer look. Let’s start with the negatives. Love is not a pass catcher with just 4 receptions this season and 8 last year. I was looking for positive pass protection moments and found one in the 4th quarter during Stanford’s comeback bid where he capably picked up the blitz and gave Keller Chryst time to throw. Unfortunately, on his next offensive play, later in the quarter, he whiffed on a block and let Chryst get blown up. It’ll take more film study to see which of those plays was closer to the reality. When you watch Love two things stand out, his spectacular speed and his tackle breaking ability. To illustrate those two skills, we’ll take a closer look at two plays from the first half. In the 1st quarter, Love took a toss left and sprinted through a massive hole for a 75 yard score. The blocking was great, yes, but Love was at the second level before anybody on the defense could even react let alone catch him. With seconds left to go in the 2nd quarter, Love took a pointless handoff meant to kill the clock. Most backs would probably run up the back of their center and head into the locker room but not so for Love. He immediately breaks a tackle five yards behind the line of scrimmage as he tries to break right, he then reverses field and breaks another tackle still five yards deep, he then makes his way up field for a minimal gain. It was a nothing play, barely a blip in the play-by-play, but it illustrated his elusiveness and also his heart. It didn’t matter to him that it was a clock killing play while the team was out of field goal range, he still gave it his all. Love is 5’10” and 196lb. He was a 4 star recruit and #215 in the ESPN300. A definitive 40-yard dash time is hard to find but there were two numbers quoted online: 4.30 and a 4.32. He ran a 10.7 second 100m dash in high school which is Olympian speed (8th place in the men’s 100m gold medal race at the 2016 Olympics ran a 10.6 for comparison). To further illustrate how dominant his speed is, let’s look at combine comparables in his size range. CJ Spiller ran a 4.37 and Jahvid Best ran a 4.34 – Love would have both of them beat. Love is on his way to being a top RB prospect. Right now I would have him in the RB5-RB7 range but might have to move him above guys like Bo Scarborough, Mike Weber and Ronald Jones if he keeps the production up. Oh, hey, speaking of production… Love has 1,240 yards and is averaging 10.5 yards per carry. Kerryon Johnson, RB, Auburn: I haven’t seen enough of Kerryon Johnson to have a full formed opinion yet but I am definitely intrigued by his potential and production thus far. While watching Michigan vs Michigan State last weekend a stat on the bottom line caught my eye: that Johnson had rushed for 3 TD in three consecutive games. That stat doesn’t even give the full story because one of those games was 5 TDs (!!) and all three came against the SEC. I was sure one of them must have been against McNeese State or some directional school. I’m not saying that Missouri, Mississippi State and Ole Miss all have good run defenses but they are all respectable Power 5 teams. Johnson did miss two games this season with a hamstring injury but it is encouraging that all three of these monster games have come after his return – at least we know there is no lingering injury. Johnson is 6’0″ and 212lb and looks to have a long stride which helps him cover ground without elite speed (NFLDraftScout.com estimates 4.45 speed). I watched film of Johnson against Mississippi State and noted his power at the goal line and in short yardage. He also looks to be a patient runner at the line of scrimmage; on multiple runs he placed his hand on the blockers back to follow them through the hole. One negative that was apparent is that Johnson is not much of a receiving threat: he has just 36 career receptions (14, 17, 5). I need to see more before I can properly give him a draft projection but he’s probably a 5th-6th round NFL prospect now and a fringe RSO prospect depending on how deep your league is. #2 Clemson @ Syracuse, Friday 7:00pm on ESPN: If you can only devote one weekend night to watching college football this week, make it Friday since there are two good games. As discussed above, there is some intrigue around who will be starting for Clemson. Either way, I don’t expect it to matter. It will be interesting to see Clemson’s smothering defense against Syracuse QB Eric Dungey. Dungey is 2nd in the NCAA in passing attempts and 8th in yards; plus he leads the team in rushing yards (325) and rushing TDs (8). He’s not as skilled as Bryant but he does pose the same type of dual-threat as Bryant. I’m not calling for the upset but, pending the line, I will be tempted to take the Orangemen with the points. #8 Washington State @ Cal, Friday 10:30pm on ESPN: It’s not often that you get a Friday night doubleheader featuring two Top 10 teams on the road. 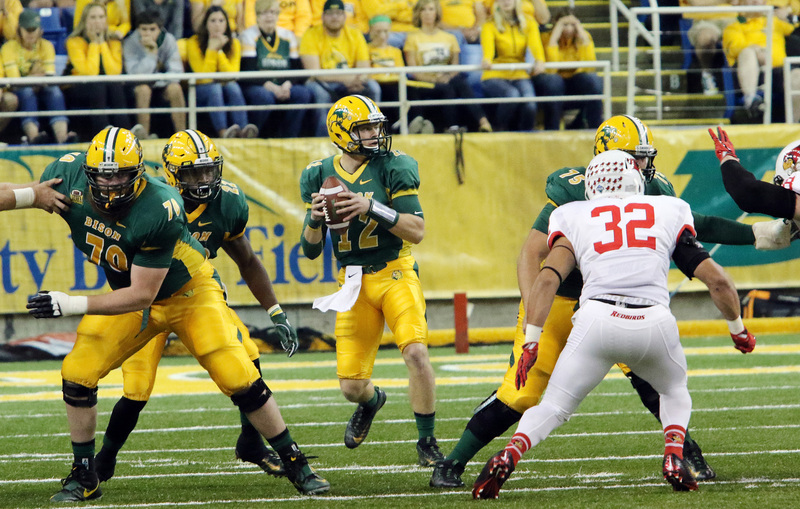 Wazzou’s defense is for real – 6th against the pass, 11th in total yards and 8th most turnovers. They will be facing a turnover prone QB in Cal’s Ross Bowers. Bowers has thrown 9 INTs so far which is 5th worst in the NCAA. He’s a high volume, low efficiency passer so I expect the Cougars to be opportunistic. This one won’t be nearly as close as the Clemson matchup but it’s worth staying up for since in addition to seeing one of the country’s best defenses, you’ll also get to watch Heisman hopeful Luke Falk pepper the Bears defense (he had 373 yards and 5 TDs against Cal last year). #6 TCU @ Kansas State, Saturday 12:00pm on FS1: The Horned Frogs disappointed me a bit last week, I thought they would have played better against West Virginia. Specifically, I thought RB Darius Anderson would do well (he went just 9-43). Kenny Hill did score his first rushing touchdown of the season but was less efficient than he has been in past weeks. Kansas State was ranked earlier in the season but lost last week to Texas and is trending in the wrong direction. If TCU wants to be in the CFP conversation, this is the type of game they need to win convincingly. #10 Auburn @ LSU, Saturday 3:30pm on CBS: You wouldn’t know it by listening to sports talk radio, but the LSU Tigers are 4-2. Coach Ed Orgeron has been under fire, from his own supporters no less. They pulled off a nice 17-16 win against #21 Florida last week so hopefully that has bought Coach O some time. Auburn’s been led lately by the aforementioned Kerryon Johnson, but it’s also important to point out QB Jarrett Stidham’s recent improvement. He started slow but since the poor outing against Clemson, he has just 19 incompletions in the last four games. The Auburn defense is 21st or better in just about every stat category except turnovers forced. Expect this one to be a low scoring 16-9 type affair. #13 Oklahoma @ Texas, Saturday 3:30pm on ESPN: The Red River Rivalry is usually good for a fun game. In my Big 12 season preview, I noted that the last four matchups have featured a ranked Oklahoma and an unranked Texas. They have split those four. OU is coming off a disappointing loss to Iowa State, a team that Texas beat. Texas has still vacillated at QB but went with freshman Sam Ehlinger last week against Kansas State. He ended up playing well and went 30-50 for 380 yards with 2 TDs and an INT. Baker Mayfield & Co were not at fault for the Sooners’ loss last week, it was the defense that allowed the comeback from a walk-on QB and a remarkable two-way performance from LB/QB Joel Lanning. This game feels like a true toss up, regardless of the early line (Oklahoma -8).